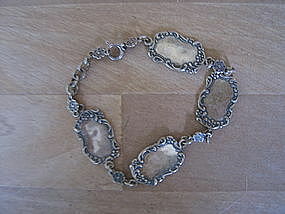 Dainty bracelet marked as Foree Sterling 925. It measures 8 1/4 inches in length and each link measures 1 x 5/8 inches. There are a few light scratches to the surface. Additional photos by email. I need your zip code to calculate the postage.